Nobody likes spam, but if you have an iPhone, iPad, or Mac, there’s a good chance you’ve found a new avenue of spam on your Apple device lately: iCloud Calendar spam invites! 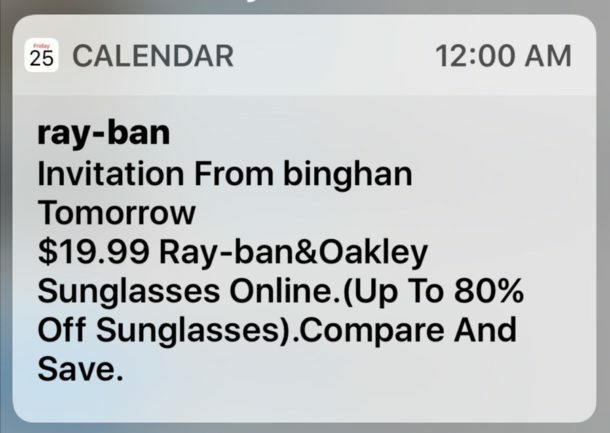 These spam Calendar invites get forced onto your iPhone or computer as notifications and Calendar invitations for spam junk products with labels like “ray-ban”, “Oakley”, “Louis Vuitton”, “handbags”, or some mixed Chinese characters or other garbage, and, amazingly enough, with Calendar and iCloud, there is no simple way to ignore them. Sometimes you might even get the same type of crud appearing through iCloud Photo Sharing spam or iCloud Reminder spam as well as Calendar invitation spam. There are a few ways you can go about dismissing and trying to prevent the spam Calendar invites from appearing on your iPhone, iPad, or Mac. Let’s review the options that are currently available. All this method does is redirect the Calendar spam from Notifications into email instead. It’s not a perfect solution but it should prevent the annoying Calendar spam notifications from showing up on your screen constantly. All this does is redirect all Calendar invitations to your email rather than showing up as notifications on the devices, with the idea being that perhaps email has better spam filters than iCloud itself. A problem with this approach is if you actually regularly use Calendar invitations then you’ll no longer get those notifications either, so you will miss those and the Calendar invite spam too. Remember if you’re doing this from an iPhone or iPad, you’ll likely need to login to iCloud.com on the web via iOS with the desktop site rather than the mobile version so that you can access the full features of iCloud on the web. Another workaround that has been tossed around on Apple Discussions site is redirecting the spam notifications into a separate spam calendar, and then removing that calendar. The problem with this approach is you will need to do this everytime you get a spam invite, which at the moment can be a few per day. Sound fun? Not really, but this allows you to delete the iCloud spam calendar invites without responding to them and without notifying the sender. The most frequently relied on option is what most users are choosing to do; declining the spam Calendar invite when they show up on an iPhone, iPad, or mac. You can certainly decline the invites, but the problem with declining the spam invites is it notifies the spam sender that your email address is active by sending them a response that their spam invite has been declined, meaning you will almost certainly get even more spam calendar invites. 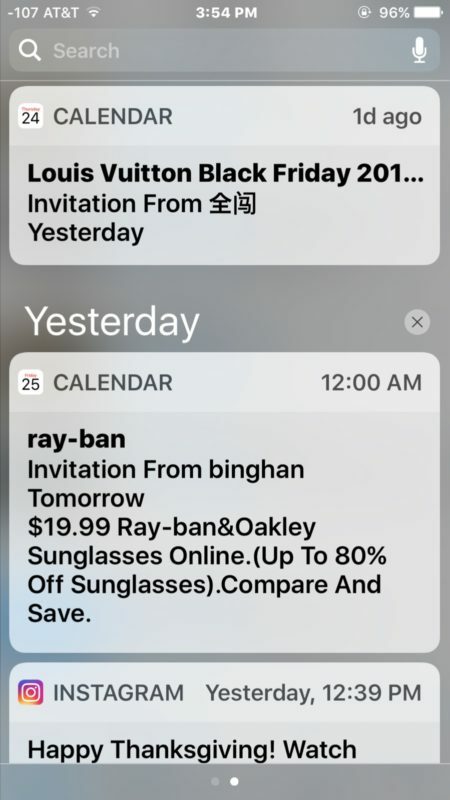 If you don’t care mind having to fend off and decline potentially tons more calendar spam invites until Apple figures out a way to block this stuff, you can simply decline the spam invite by tapping on the “ray-bans” or “Louis Vuitton” Chinese spam and notification and tapping “Decline” at the bottom of the spam calendar invite. Those are the three methods of managing iCloud Calendar invitation spam, none are ideal but they can serve to dismiss and ditch the calendar spam if need be. At the moment there is no perfect method to get around these, and the problem will hopefully be addressed by Apple soon, either with a method to ignore the Calendar Spam invites completely or better yet, for Apple to block them from appearing in the first place. Hopefully this happens sooner than later, otherwise don’t be surprised if this new form of spam really gains even more popularity due to its highly intrusive nature. The good news is the iCloud Calendar invitation spam problem is so widespread that it has received mentions in The New York Times and CNBC, so hopefully that means we’ll get an official fix sooner than later. Are you getting iCloud Calendar spam invitations on your iPhone, iPad, or Mac? What method did you use to get rid of them? 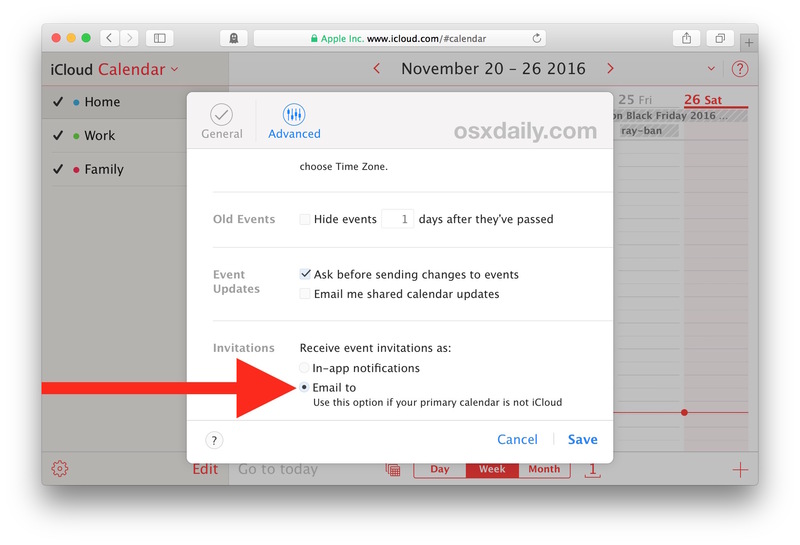 Do you know of another better approach to ignore and remove the iCloud Calendar spam invitations? Let us know in the comments! I have been getting iCal spam invitations to Calendar and iCloud Photo Sharing spam for a few weeks now. It’s always Chinese garbage, seems like obvious spam to me. I dismiss them and they come back more and more. I am tempted to delete my iCloud email account because I think that is where they are coming to and from. Apple Support has no idea what to do, and Apple has no idea what they are doing with the cloud. Steve Jobs would have been furious at Eddy Cue for this. I disabled iCloud Calendar completely, it’s rubbish and now a spam engine that can’t figure out a fix. Disabling iCloud Calendar stops them completely. I don’t know how a company like Apple makes such junk like iCloud, the cloud divisions of Apple are a complete wreck and I don’t trust them for anything. What else is bad with iCloud and why? Which calendar do you use now? I use google Apps now. I use the Gmail/Calendar/Contacts they all sync with the apple Apps. I have also stopped using Microsoft office and have started to exclusively use google drive / Docs / Sheets / Presentations. Here’s what I think Apple should do. 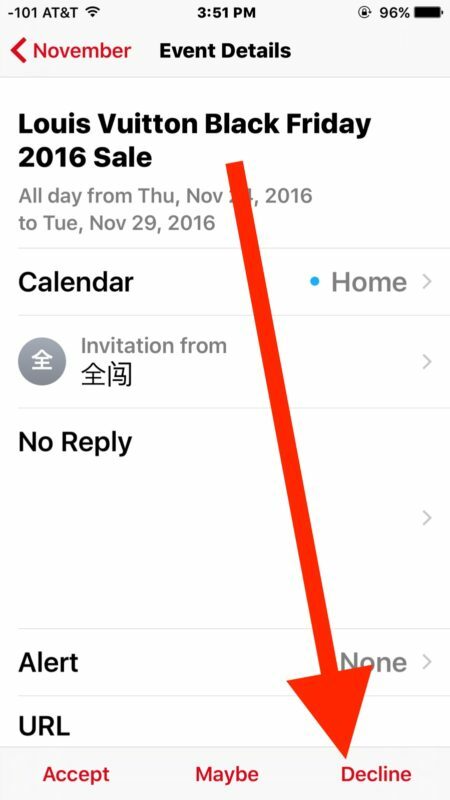 Have a preference option in your Calendar that will block anyone from sending you an invite that is not in your contacts! As for me, I think this would be the perfect way to block any unwanted invites. Chances are most people who uses Calendar, are only going to receive invites from the people they know, not random, spam accounts. So having an option to limit event invites to Contacts only, I think would be the best solution. As well as, having another option to disable invites entirely. Well it does often happen where people may send me an invite that I do not have them as a contact but know them so i would accept a party/event invite. The downside of your suggestion is for anyone to send you an invite you would have to first add them to your contacts and then either leave it or delete it. So that is not a clean way to solve but I do agree with you that ICloud is a royal pain in the arse delivering NOTHING. Steve Jobs must be turning over in his grave. On iPhone or iPad go to Settings > Calendar and turn off Events Found in Apps. Gut instinct says that is the most efficient way of stopping it. Unfortunately that won’t stop the iCal spam notifications and spam invites from coming in, that only searches for invites from other apps like mail and messages. According to the internet, Apple is supposedly working to a fix, hopefully it’s not yet another software update because every time I update software my stuff gets worse. They should be able to stop spam on the server level. I suppose they could use magic instead of software to implement the fix. They do have experience there, after all, what with their magic mice, keyboards and trackpads. I hope installing a bit of magic on your phone gives you less trouble than a software update. I turned off events found in apps and it DID NOT stop the addition of bogus SPAM calendar events. Just saying this is NOT a fix. Disabling iCloud Calendar and iCloud Photo Sharing will stop the junk spam coming in. I wonder if iCloud executive Edward Cue is aware of this problem? It was in the New York Times, it’s not exactly small scale. I’ve been waiting till I get home to my Mac where Calendars has the option to ‘Delete & Don’t Notify’ but it really is crazy Apple have allowed this gaping hole in their App. I thought I was only one of a few getting these but it appears it’s quite the opposite… Here’s hoping Apple at least acknowledge there is a problem and hopefully say they are working hard on a fix. Frustrating and annoying, it’s not what I want my Apple devices to become. Can you explain where on the iMac you can delete and not notify a calendar event? I cannot find it. I can see it when I delete a calendar but I cannot find a way to explicitly delete an event. This is all Apple need to implement for now. The best way I’ve found is just to turn off iCloud calendars all together (in Settings, iCloud). I don’t use the iCloud calendar, only gmail, and all these spam calendar appointments come into the iCloud calendar. I have not received anymore since the iCloud calendars were turned off. Well, good for you, but many of us actually use the calendar! I’ve relied on the superior device syncing and security since the MobileMe days. It was one service for contacts, calendar, everything, that isn’t controlled by a creepy advertising company like Google, not to mention Google didn’t even offer anything close to the push data, synchronizing, and storage capabilities back when MobileMe was around. Anyway, my life is pretty much in there, so turning off the calendar isn’t an option. Option 2: Creating a new calendar in iCal and deleting after dragging the invites into it seems the best fix for now. I would be surprised if Apple doesn’t ad a blacklist feature soon… they certainly should! No one else mentioned this solution, so I’m grateful that you posted. I had always assumed invitations were handled by iCloud as email, rather than a proprietary internal messaging platform. Learn something new every day. Yes! I am getting the same block to this workaround. Okay, I just found how to make it work. Make sure you are moving the events from your PHONE, not by logging into iCloud via browser. Good luck! I have a solution Apple could easily implement: Block anything that includes a Chinese character. I know nothing that’s incoming from a sender whose name includes a Chinese character will ever be of interest or value to me. This is why having your own domain is worth the money. With iCloud/Google/etc. you really don’t have a whole lot of options. With your own domain, you can block email originating from entire countries. I block anything that has been routed through China, Russia and India. I also block entire domains. Unfortunately, having your own domain costs a little money, some time invested, and a little expertise. I have my own domain and indeed I am considering using it, but isn’t part of the problem here that iCloud calendars aren’t tied to Apple domains but are a part of every Apple ID? So even if you sign in with your own domain name, you’ll still get spammed? And Portugese, too. All those infected third-world copies of WinXP gumming up the internet! Uhm, why isn’t the second option listed first? It’s much better to actually delete the spam (while not notifying the sender) instead of deleting + notifying or worse: sending the spam to email while removing your ability to get calendar notifications, period (option 1)! Pilgrim’s solution worked for me. Disabled iCloud calendar and invites disappeared. Removing the entire feature is not really a solution, though. For people who actually use the calendar, receiving invitations might be useful or even necessary. The real solution should be a customizable blacklist in iCloud, not to mention the ability to delete calendar invites outright without sending a notification to the sender. Disagree with “Blues” on a “customizable blacklist.” I don’t broadcast my iCloud email account (I don’t even use it that much), so I don’t know how it got into spammers’ hands in the first place. I’d be much more comfortable with a whitelist, possibly with some filter criteria, for Calendar, much like the filters for Mail and possibly using the same criteria. If the origins of the Calendar spam are accurate (I used Finger and whois to look the sending accounts up; they’re Chinese domains and servers), they now are being filtered by Little Snitch on my system. I lso a/pasted the Asian characters into a FB search just for kicks and blocked all the members there as well, just in case. Who knows what evil lurks in the depths of FB hacking? I don’t know yet if Little Snitch filtering is truly working or if I will see an escalating number of these spam messages. So far I’ve only had two, but they arrived (and woke me with notifications) in the wee hours. Those are the first two and last two such things I ever want to deal with. There’s no excuse by Apple for allowing this bad behavior to affect an enormous number of iCloud accounts. iCloud is nice and well integrated into the walled garden, but there are alternatives if this isn’t tamped down pronto. Having email filtering of the calendar would seem the best solution. Surely an easy fix for Apple. This reflects poorly on Apple user experience. Getting iPhone calendar spam for last two weeks, more every day. Just deleting, anything else is to time consuming. Hoping Apple fixes this soon, don’t understand how it’s happening after years of no issues. I’m surprised Apple doesn’t already have a fix, from the forums you can see that it’s been going on in significant volumn for about a month. We need the capability to block senders and delete invitations without notifying. Doesn’t sound like too much to ask. You’re the only smart person in this entire comment section. Even MS Outlook will let you delete a calendar invite without sending an update to the sender!! This is a pretty simple fix Apple! And a flexible spam/junk filter that allows you to block by email address, whole domain, etc. is not that hard. Come one, Apple! The 90’s is calling and wants their email program back! I thought angry people with nothing better to do than complain about things while adding nothing useful to the conversation were too busy looking at facebook. rofl. what a joke. wake up and get a job. How about if Apple had an option to only allow invites from your contacts? That could work. there is already a way to only get evnts from your same email app. i.e. for me anyone who has a gmail account and is using that in their apple calendar. If you are using icloud calendar you only get email events from icloud. You can check this in icloud – calendar – gear (bottom left on my ical) -preferneces- advanced at bottom check mark 1st box in-app notifications change to email to (your email) use this option if your primary calendar is not icloud. The examples I’ve seen, look to originate from domains like *.win, *.club, etc. These are spam-heavy domains that on my work email filters we just reject the entire domain. You want to have a website there? Great, but don’t send email from it! I wish for a checkbox “invites only from contacts list”. I have a family iCloud calendar that is impacted. I also clicked on the “decline” the first time this happened, so now I have three more sitting in my calendar. I find it hugely frustrating as it seems to be a security breach (probably isn’t, but having uninvited stuff on my computer is always feel weird). I did the first thing on this list of logging into iCloud and changed the settings. I logged out of everything and back in, but the three invites I had are still in there. I also added the emails to my “junk” list in Rules in Mail. Again, the invites are still in the calendar. It’s not going to delete the existing invites that were already sent to you, but it will block any invites that are set in the future. The even more fun way to deal with this is to click the links (in a VM for protection) and then write incredibly offensive things in the form where it asks for name, address, etc. So far, I have, in Chinese, told the Chinese senders exactly what I think of China and how I hope President Trump bombs them into oblivion. How foolish does a company have to be to build a calendar that both lets random people add events without your consent, and then doesn’t allow you to delete those events without notifying the sender. Dear, Apple: we are not all morons who can’t handle basic decisions like whether to tell someone whether we will accept their meeting or not. I switched to Samsung after you started sending all my texts to my wife’s phone without asking me. What is wrong with you? I agree with Chris. 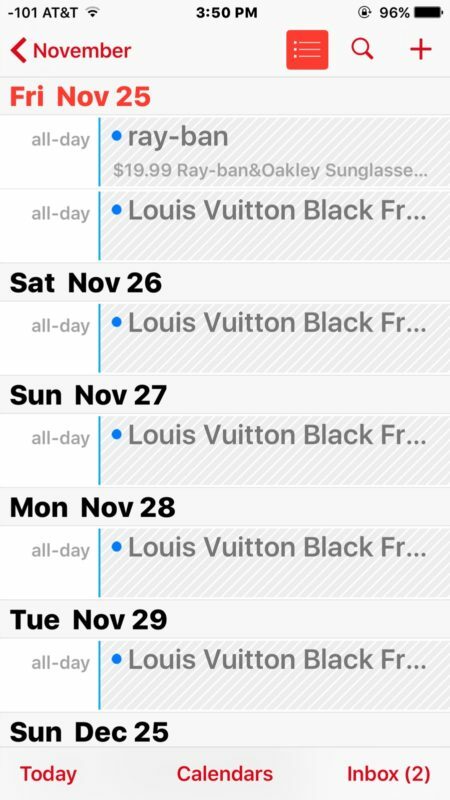 This is a major Apple flaw, allowing spammers to add events into your personal calendar without your consent. This started happening to me for the first time during Thanksgiving weekend. I got hit with 4 more spam invites today and I’m very aggravated. I will try the steps recommended above. Hopefully one of those options will work! Best solution? Don’t use iCloud for anything. Huge security hole! If Apple doesn’t fix this issue soon, I’m out! So very frustrating. The only thing I could think of doing is adding the chinese email as a contact in my phone, and then blocking him. Not sure if that’ll work yet (?) and whether that will block his calendar invites, so will just wait and see. I understand others can still send invites, but this specific idiot has sent me three invites now in the past few days and my patience is wearing thin. I’ve my iCalendar synchronized with Outlook on my Windows laptop. There I can delete the invitation without notifying sender. Spamassassin and constant email scanning comes to mind, but dunno how to implement that with iDevices. I created contacts from the sender and added to my blocked list on my phone (probably won’t work as it it’ll be a different contact each tome…). I also created a junk calendar but don’t have it visible in my calendar app so I can hide the events in a hidden calendar, then can delete the calendar occasionally, not every time. Jules, that is a great idea! Like others I had deleted the first one, and so identified my email as live. Now I am plagued with spam in my calendar. I had forgotten about hidden calendars. Now I don’t need to delete the spam folder every time, just save up the spam and delete the folder occasionally. Many thanks for a great idea. I turned off the Calendar on my devices, I don’t use iCloud foe anything really. I’m sure I’ll have plenty of spam in my calendar but I won’t likely ever look at it anyhow. sorry, I realise this isn’t relevant to the point of the article, but could you not refer to chinese characters as “chinese garbage”? I know you probably didn’t mean for it to be offensive, but it is just casually racist – it stands out to me as a chinese person. This article is intended to discuss ways to stop iCloud Calendar spam from arriving to the end user. All of the iCloud invite spam is arriving out of China (at the moment anyway, though surely other spammers will learn this iCloud spam method soon if Apple doesn’t put a stop to it). The only relation to the Chinese alphabet or Chinese characters is that sometimes the iCloud spam contains mixed characters, usually with a solicitation for some product. Hopefully there will be an official update to address these soon, they are coming through in waves for huge numbers of users. In the meantime, the approaches offered here should help to alleviate some of the iCloud spam. How do I move the junk invite to my spam calendar? Create a new Spam calendar, then tap on the junk invite and choose “Edit” and assign it to the Spam calendar. Tried to move spam, but got the message that only the sender can edit the notification. Arrgh! They figured out a work around the delete calendar option! I did all three steps, but I also blocked the senders email address in my gmail account settings. You can see and copy the email address in the invitations. Does anyone experience the same problem with their Google calendar? The recipient list is targeting icloud.com and google.com adresses in alphabetichal order. Seems odd to try “inviting” google accounts if those are filtered? Moving to a “spam”-calendar should work even if you not have organizer (edit) rights of the vcal-event. Changing details in the event however, like notifications, do not work. I just went to the calendar settings in the app (middle button at the bottom) and unchecked the option ‘all iCloud’, unchecked the ‘iCloud home’ options and left the others – because the promotions come up on my phone with a blue dot – the iCloud home is equated with the blue dot. Once unchecked all the promotions disappeared. You can create a new colour dot for other categories if you want and forget you ever had the previous blue one. No promotions – bliss. Rm – this seems to be the answer! Many thanks. This worked very well. I changed all my color tabs so nothing resembled the blue one. Then I right clicked on the blue tab in the iCloud listing of calendars shown on the left side of the Calendar and when I clicked delete I was given the option to delete and NOT notify the sender — hopefully this will continue as I deleted that calendar tab. I have done this on the Mac and if need be will do it on the other devices. And Perhaps Apple has listened and provided this option to not notify the sender. How about a “decline and don’t notify” AND “block sender”. Pssst – this functionality has been available since the 1980’s – what the heck?!? I did all the steps on all different websites and I’m actually getting a whole lot more of that Chinese crap! I even chatting with Apple yesterday and they were totally surprised because they never heard of this issue. I’m am so pissed off! CNBC even reported about this flaw! I noticed on one forum that this problem stretches back to 2012. I’m surprised that Apple hasn’t added “block sender” and “delete and do not notify” to the Calendar Apps. It’s very annoying to get this rubbish going across all my devices! Unfortunately, none of those three suggestions in the article above work very well long term. The spam will keep coming. I recommend instead that users contact the Apple Care engineers. It has two benefits. Firstly, it brings the problem to the attention of Apple directly. Secondly, (and better) they solve the problem (well the problem seems to have been solved for me – I have had two spam-free days for the first time in over a week). The Apple Care Service is free of course if your device was bought less than a year ago. Thank you! I was looking for this exactly. It was a pain but it worked. I appreciate you publishing the solution. There’s a new variety of calendar spam I received in the last day or two. This is a repeating, daily 3am appointment to earn $1500, blah, blah, blah. This is set to start July 1. It has a reminder alarm at 245am. It won’t let me turn off the alarm or move it to another calendar (i.e., spam calendar which I would then delete). I signed in to iCloud where previously I could report calendar spam as junk. It didn’t display in iCloud. In other words, when iCalendar spam made news in Nov 2016, several fixes were discovered. However, this new variety of spam defeats all those fixes. Isn’t it crazy how many of us actively expect to receive calendar invitations from people we don’t know? Surely invitations should use a white list approach rather than a black list. Seems obvious to me… And we all have a whitelist really available… It’s called a contacts list … Why do companies that spend billions on tech insist on leaving these avenues open for spam?